Lies, lies, and damn statistics. The property world is littered with statistics, most are interesting however some are a lot more useful than others. Most of the property-specific data is largely useless when it comes to deciding on a location to invest in. Change in medium values, rental yields, vacancy rates, days-on-market, auction clearance rates… this data is readily available however how will it help you to select a location to buy an asset and likely to hold for several years? The much more important data relates to the economy. Investors who have a comprehensive understanding of which industries drive a location’s economy PLUS an ability to forecast the outlook for each industry will be more capable of selecting locations BEFORE they start moving. At the end of the day, property is shelter. More people will want to acquire shelter in a location if new job prospects are created. Similarly, more people will look to upgrade their existing property if they have more confidence in their job and the local economy. Forward and backward, economies and consumer sentiment move before property markets move! 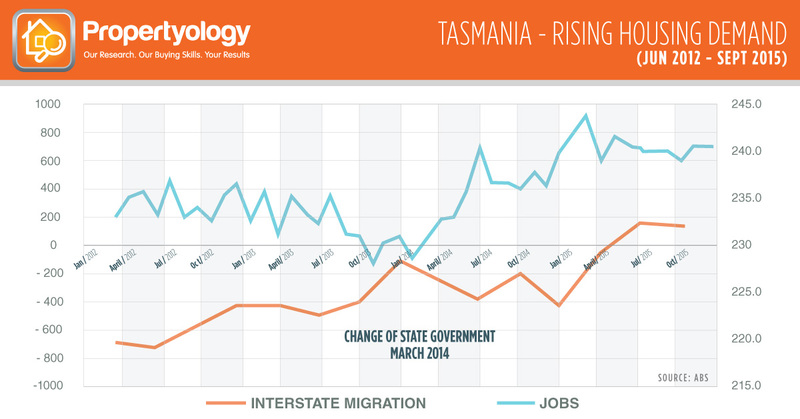 To illustrate this, we have put together a graph containing two (2) basic metrics for Tasmania. Look at the trend of the black line (jobs) from early 2014. A definite upward trend in jobs, which was subsequently sustained, resulted in movement of people from interstate (refer the orange line from early 2015 onwards). Note the order of events: jobs THEN migration. Now do you see what we mean by the SCIENCE of property markets?